The prolific novelist Claude Klotz, better known by his pen name Patrick Cauvin, died on August 13 from complications due to cancer. He was 77 years old. Born in Marseilles, Klotz earned a degree in philosophy from the Sorbonne and for several years as a young men taught French in secondary schools in and around Paris. In the 1970s, burning with frustration of France's role in Algeria, Klotz began a series of violent thrillers under his own name. A few years later, he adopted Patrick Cauvin in order to writer romantic novels, such as his best-known work E=MC2, mon amour. He continued on this bifurcated career path for as long as he would put words on paper, shocking fans from both worlds by the occasional work that might seem more at home in the other tradition. The French-language comics and news clearinghouse ActuaBD.com notes that Klotz worked on several comics projects in his career. As was the case with his prose career, he worked with collaborators on his first comics effort, scripts for Morris and Lucky Luke. 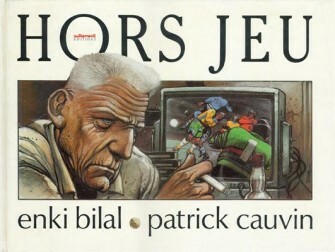 He worked with Enki Bilal in the late 1980s on de Hors Jeu, a futurist sports book, and using his real name wrote two books for Max Cabanes in the 2000s in the Bellagamba series. The last two books were described as perhaps more lighthearted than some of the author's other comics works. The comics works were considered part of his branching out into other media from the more strict one-a-year novel-writing days of the 1970s, and the work with Bilal is considered by fans of the author a labor of love. His prose work -- over 30 novels thus far -- will continue to be published for one or two volumes posthumously.